The "Gents Race", as everyone calls it, has certainly evolved over the years, but one thing, at least, has remained consistent for all eight versions of this event so far. That being that a team of five men have ridden in it dubbed "The Careless Whispers". That event happened again over the weekend, and since I am one of the Careless Whispers, this is the race report from this team's perspective. Once again I made the smart decision to bring the family down the night before and stay in Ankeny, Iowa. That sure beats driving down the day of and having to drive back again the same day. Since the Careless Whispers are not concerned with speed, we get seeded a really early start time. That would make it so I had to get up at about 4:00am if I wanted to get down there before the start time and have any chance of yakking with folks pre-event. I was anxiously checking the hourly forecast while we were waiting on our food at the Ankeny Diner Friday evening. The temperatures were looking to be into the mid-teens above zero at the time I was going to have to leave and meet team captain, Steve. He was riding up from his house in Johnston, Iowa and I was planning on riding from Ankeny to Slater with him. I was seriously questioning the wisdom of this plan as I ate my fish and chips. But I was all-in, so there was no turning back at that point. I ate my dinner and went to sleep with the idea of waking up at 6:00am to grab some breakfast before heading out into the chilly air. Cruising the Northwest edges of Ankeny looking for Captain Steve in sub-freezing weather. I awoke on time after a decent night's sleep, had a light breakfast of an omelette and some Canadian bacon, and then set off to meet Captain Steve at 7:45-ish somewhere Northwest of Ankeny on a gravel road. At least the Sun was out and the Northwest wind was light. It was about a 10mph breeze at this point. Still, at 17°F that resulted in a pretty chilly windchill figure. This was a far cry from the 50's and cloudy skies from the year before! After a couple of quick text messages I hooked up with Steve and we began our Northward trek to Slater. That's where you can find the Nite Hawk Bar & Grill where the Gent's Race starts and ends. The gravel vacillated from big, chunky white rock to very smooth, sandy, grittiness. We were slogging along at around 10-13mph and realized about four miles out from Slater that we'd have very little time to get signed on, take care of any loose ends, and get to the starting line in time for our scheduled 9:26 departure. Steve kicked it in and sped up the burly Salsa Cycles Blackborow as much as he could. We arrived and saw that team mates Bob and Sam were there already. Now the rule is that you cannot sign on until all five riders are present and we were still missing D'Corn. I decided I'd better get in line for the rest room, and I was feeling okay since only two guys were in front of me. I'd have time! It was already after nine o'clock in the morning. Then I looked up and I saw D'Corn walk in, so we would be good to go. I finished up my business, we got signed on, and I headed outdoors to grab my bike. I no sooner got my bike when I heard "Careless Whispers! Careless Whispers are up!" So we were on deck! I rushed over and one by one we all got on the line with about a minute to spare. We got our picture taken at the start, (for the eighth consecutive Gent's Race time) and we were off! It wasn't a whole lot warmer, but the short time that we were in the building allowed me to warm up my frozen toes from the ride up. However; now my hands were freezing, since my gloves had soaked up sweat in the interim. Oh well! The big deal was that the Sun was out and we were all in good spirits, enjoying the company and the day. It really made a big difference in our attitudes. The first miles went by without incident. We got passed and we passed others. We got into the 10 mile stretch of head wind and we all just plugged along with no issues. We didn't stop until someone called up for a nature break. Well, we kind of had a slow up right out of the gate when Bob dropped his doughnut package. He grabbed it and was back on without much of a hitch though. Otherwise we powered through the headwind section and made the right turn when Steve got frisky. See, Steve had just told us before getting out of the headwind section that we should expect that he would be off the back, having trouble keeping pace, since he was pedaling that huge truck of a bike. However; it was the rest of us that found ourselves off the back when Steve hit the afterburners and took a flyer for a couple of miles. So much for not keeping pace! Hi jinx at the checkpoint were my downfall. We reached the checkpoint with no trouble. We were all feeling really good, and we were actually setting a great pace. Not too many of the "super-fast" teams had made their appearance or passed us on the road. We have a tradition though. It is that we drink a LOT at the checkpoint. I was in trouble already when I got there because I was hungry and then I realised I didn't have anything to eat but gel packets. Well, Sam shared a couple of vegan energy bars, I got a handful of chips from D'Corn, and...... Yeah. So I helped in killing off a couple of Bud heavies, two cans of Four Loko, and a few swigs of whiskey. Then I mounted up and saw Rob from Lincoln. The Cycle Works guys were all there and so I stopped over to say hello. When that was over I think the alcohol took over and I just left without the team! I was way up the road before I got a text from Steve that they were trying to track me down, so I stopped to wait awhile. I decided then that I was better off riding than trying to stand and I took off again. Well, they caught me eventually and then they had to baby sit me after that point. So this year it was me that had "issues". Seems like one of the team seems to be this way every year, and it was my turn. I was "okay" as long as I was riding, but whenever the guys wanted to stop I would have issues remounting and I actually fell a couple times. Bad boy! Anyway, once we were rolling I seemed to be holding their wheels okay. I didn't know why at the time but the word came back to me that we were taking the bike trail from the East back into town. I knew that was throwing in the towel. I found out later the guys decided that if we had continued on the route we would have not made the 4:00pm cut-off time so they decided to bail out at the crossing of the trail. Hey, I am absolutely okay with that! I had zero say in the matter anyway in my condition. When I got back to the lot where everyone was parking bikes I sat down at the corner of an adjacent steel building and just chilled out for a while. Suddenly Squirrel and Steve were standing over me asking if I was hungry. Well.....yeah! I was, so Steve bought me a burger and that set my boat aright almost instantly. Then Mrs. Guitar Ted came along not long afterward and collected me and we were off to the house. It was a fantastic day on the bike and I got over the Gent's Race distance despite cutting the course at the end since I had ridden up with Steve. So it was that the Gent's Race 2018 ended. Can't wait till the next one, but maybe I'll back off on the juice and up the food quota when that happens. 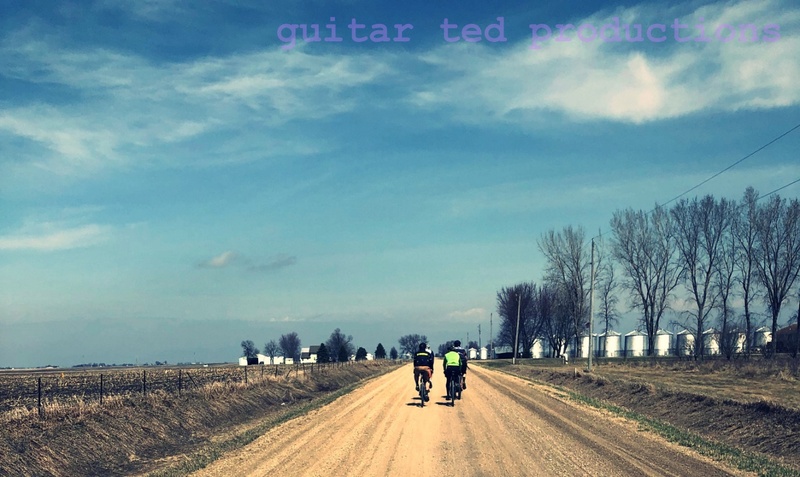 Thanks: To Bike Iowa, The Nite Hawk Bar & Grill, The Careless Whispers (Bob, Captain Steve, D'Corn, and Sam), any and all volunteers, and all the riders. Special shout out to the organizers of the Renegade Gent's Race. Another well run event! It's always a good time when the 5 of us hit the gravel together. Glad we could help you blow off a little steam and stress before TI :) I'm already looking forward to #GR9 next year. I should have picked your brain before we signed up, with a 10:30 start we didn't leave a lot of time for tomfoolery; especially on fat bikes. Next year we need to stress we are very, very slow.